Explore hundreds of Spotify tracks curated around a Sea of Thieves theme! When you're sailing the Sea of Thieves, do you ever want a change from shanties? Feel like something a bit more contemporary to put you in the mood for being nautical but nice? Maybe you want to get your groove on when you're away from the helm? 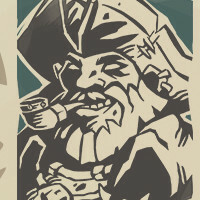 That's why we've compiled six themed Spotify playlists (so far) for Sea of Thieves fans, curated by the Rare team to help you be more pirate! The tunes in question have been selected from a wide variety of artists and genres, always with a connection to the theme, some more immediately obvious than others... and the occasional sneaky song title dropped in to tease a game feature still to come. So don't just expect pirate-themed music (such as the stylings of the popular Skullduggers), because you'll also find everything from Kanye West to The Clash! Yes, the first playlist we created was this amazing smorgasbord of all things Sea of Thieves. 91 songs (that's nearly six hours of music!) which encapsulate the pirate life, even if some were just chosen because there's a single line that has the word 'pirate' in it (get used to that as the themes get harder to stick to). The infamous Dan Bull's rap shanty ode to Sea of Thieves makes the cut for its sheer swagger, but so does Portishead's fragile "Wandering Star". These songs will take you through a huge variety of genres from several decades, so prepare to venture beyond more horizons than just the ones in the game. The Dropkick Murphys are an easy addition for a pirate party, but "Shake It Off" by Taylor Swift perhaps approaches the Sea of Thieves experience from another direction! When Festival of the Damned landed, it was time to refresh our playlist presence and craft something a little more thematic. So prepare for tunes that encapsulate the mood of this crazy in-game festival which honours death and returning to life (we're pirates for all eternity on the Sea of Thieves! ), piracy and all things dark. This festival strangely coincides with the similar Halloween celebration in the outside world, so many of these songs share that spooky vibe. With the Festival of the Damned revolving around otherworldly lights from the Flames of Fate, it's no wonder that we see The Bangles here with "Eternal Flame" and The Smiths with "There Is a Light that Never Goes Out". The eclecticism reaches new heights with a very creepy "Halo", then hits the coffin nail right on the head with "(Don't Fear) The Reaper". With the arrival of Shrouded Spoils, it seemed that people enjoyed listening to thematic (and incredibly random) music as they navigated new content – so of course we produced another playlist! This one has a rather mysterious vibe, starting with "The Spoils" by Massive Attack. Since fog was introduced in this content update, it's only fitting to see "Fade to Grey" by Visage slipping into the playlist too. To keep things upbeat (and act as a nod to the new Stronghold Gunpowder Barrel, or mega-keg) we also have "Boom! Shake the Room", plus "Mr. Blue Sky" by ELO to remind you of the fun times awaiting on the other side of the murky shroud. Watch out for almost any song with the word 'fog' in it, folks – we're sailing into the unknown on this one! With the team very much enjoying spending an afternoon shouting out names of songs in a fit of creative madness, three more playlists were added to the plan, one for each Trading Company. To begin with, if you want to represent your coin-counting cohorts in the Gold Hoarders, stick this playlist on and listen to – yes – "Gold" by Spandau Ballet! Note that this is the Non Stop Edit, because Gold Hoarders never stop wanting more gold. On that note, we also have "Just Can't Get Enough" by Depeche Mode (we're sure the Gold Hoarder himself would approve) and of course "Going for Gold". Meanwhile, '90s dance anthem "The Key, The Secret" reflects the keys that each Company representative uses to get into the sealed chests scattered around the Sea of Thieves. Nice! For the mystically inclined pirates out there, the Order of Souls represents the magic and mystery of the Sea of Thieves as well as the chance to get paid for smashing skellies. So their playlist encapsulates both of those moods, starting with the very fitting "Voodoo People" by The Prodigy. With a spooky twist, we then have "I Put a Spell On You" by Nina Simone, sure to make a shiver run up the spine of anyone foolish enough to mess with these dangerous women. Feeling a bit more upbeat? "Power" by Kanye West slides into this playlist to give you the energy to swing your cutlass at a Skeleton Captain. When the (bone) dust settles, relax with "Pure Shores" by All Saints as you count out your bounty. "Signed, Sealed, Delivered" by Stevie Wonder. Yep. That's how the Merchant Alliance playlist kicks off and it's so thematically perfect that the team here at Rare had a minute's silence for everyone who had to come up with suggestions after that. Yes, these playlists are as wildly diverse as they sound and sure to really confuse anyone who overhears them. Put a new spin on your next Sea of Thieves session with some of these eclectic tunes and you're sure to be tapping your toes, as well as discovering new music... and isn't discovery a cornerstone of our beloved game? Watch out for more playlists in the future as new content updates are released. It also seems a shame that earlier updates missed out on playlists, so maybe that's something we should put to rights. For now, enjoy trying to figure out the thinking behind some of our more obscure song choices! The dust has settled and the winners of our Forsaken Challenge have emerged! Sea of Thieves Year One By the Numbers! Find out who took the top spots for fan fiction and artwork in our most recent contest! The winners of our latest contest have returned from the Ferry. Feast your eyes on the winning submissions!